Today is the day for the $100 Room Challenge Reveal and this is my new Lake House Bedroom. 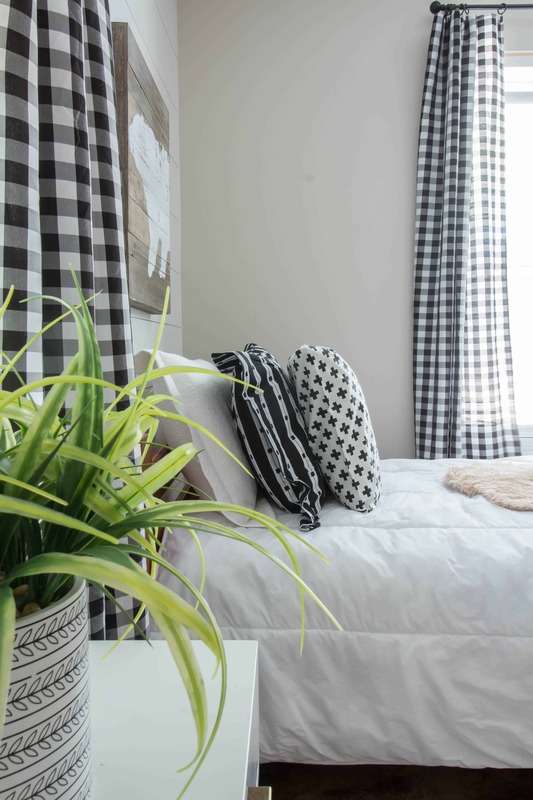 If you are unfamiliar with the $100 Room Challenge, it is a challenge hosted by Erin from Lemons, Lavender, and Laundry. 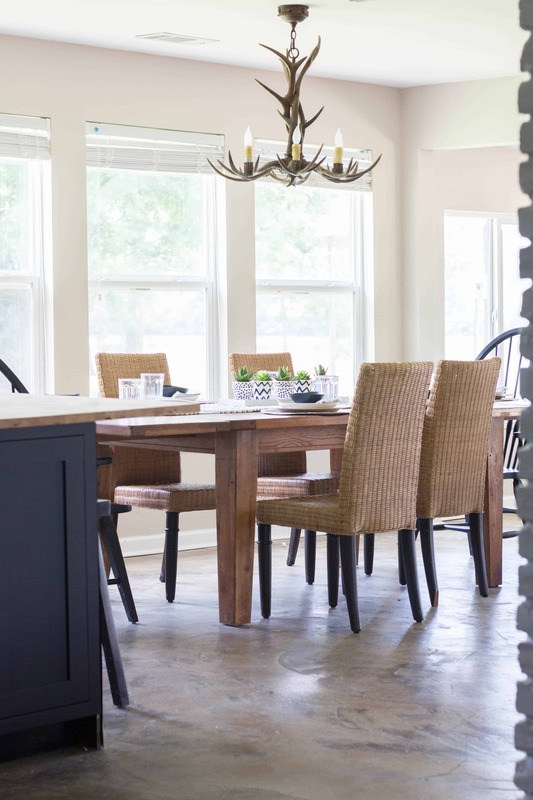 Erin invites a group of bloggers to makeover a space in our homes in four weeks but we can not spend over $100. By doing this, you have to really get creative. If you think about it, a pair of lamps can cost you at least $60 at Target and a rug can cost over $80 at most lower price stores so you must find a way! This is my favorite challenge to participate in. Let’s look back at the room before I started the makeover. After we purchased our lake house and renovated it, we furnished it as inexpensively as possible. We have slowly decorated our house but we have not done anything to the room that my son sleeps in. I knew that this was the room that I wanted to makeover. 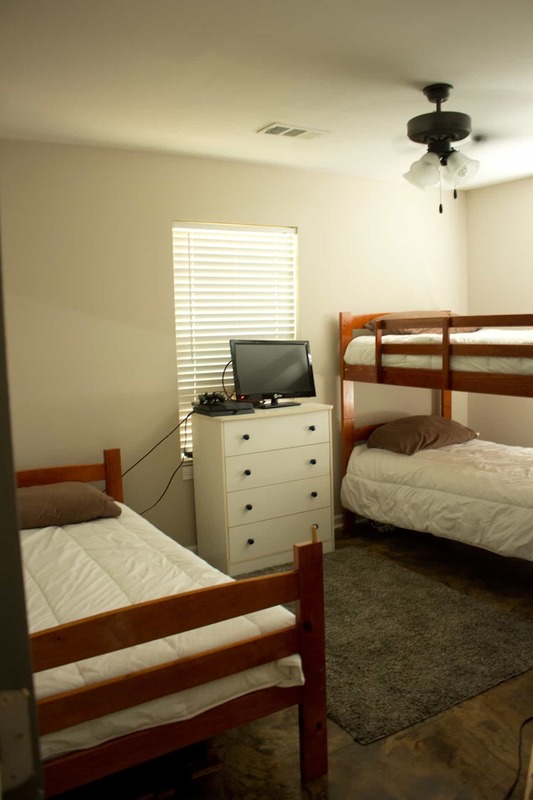 I want my son and guest to be very comfortable sleeping in this room but this room is very small. First, I searched Pinterest to get some ideas for what I wanted this room to look like. My husband went to Montana to snow ski and to fly fish for many years before I met him. He loves the rustic cabin feel in a home and he would love to have a cabin on a snowy mountain of his own so when we decorated this home I encouraged him to chose a lot of the decor and he always went with items with a rustic cabin feel. I think he usually makes great choices and I want this room to flow with the rest of the house. I found the art above the bed’s at Hobby Lobby when they had several aisles of decor for 75% off. The moose and the bear were $8.75 each. I removed the top bunk because it is so hot under the top bunk and this way we can feel the fan when we sleep. 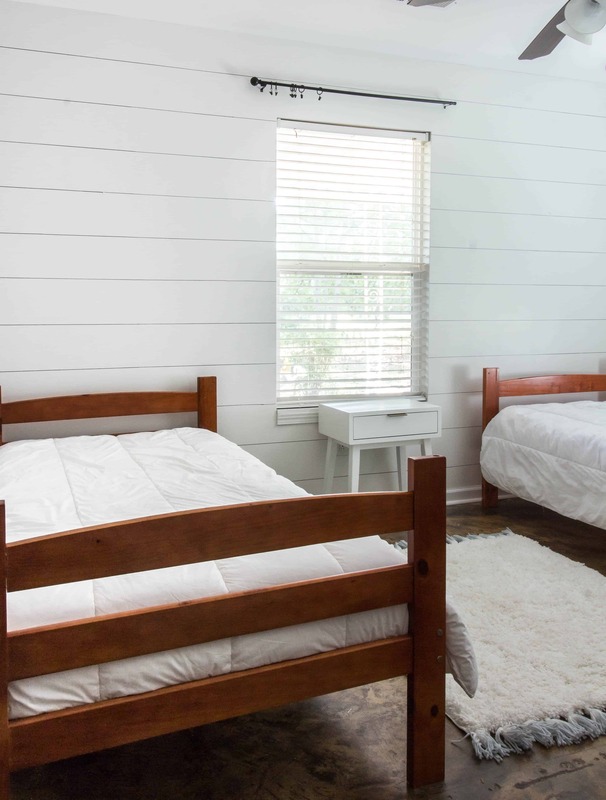 I thought about painting the beds but there are four bunks and I may resell or give these beds away one day and I do not want to paint four bunk beds. 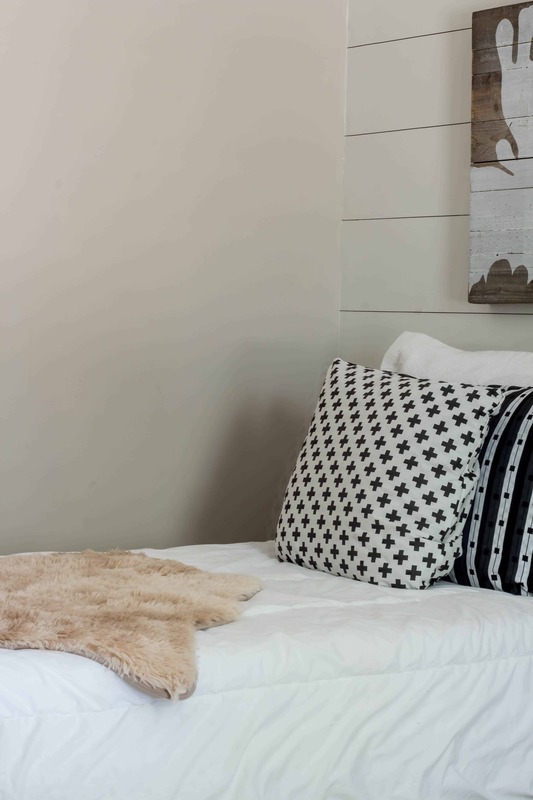 Shiplap is not in the budget so I am going to do a Faux Shiplap Wall with a Sharpie Paint Pen that I am seeing being done on Instagram and Pinterest. This project cost $2.64 for the paint pen and it looks like the real deal. If you do this project, you need to use a Sharpie paint pen and not the Sharpie permanent marker so that it will be easy to paint over one day. I only had to paint one wall and I had leftover paint for this small wall. 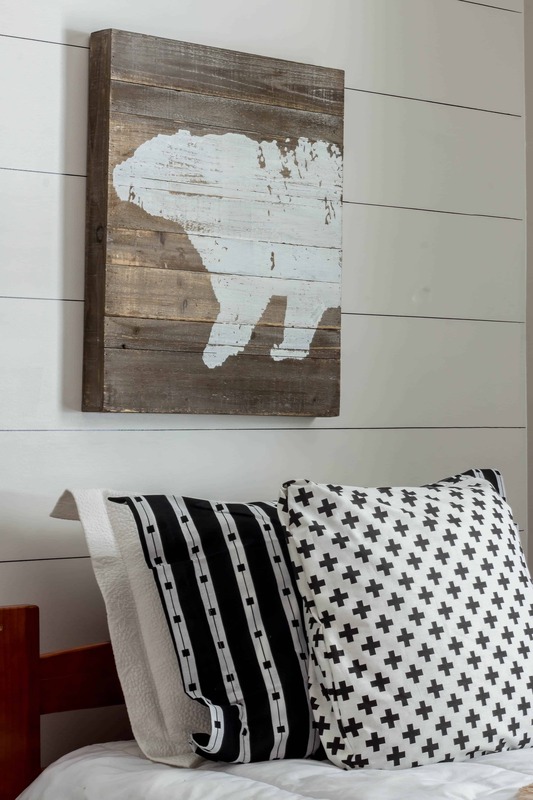 You can see my tutorial for the Faux Shiplap Wall. Curtains that are more than 84 inches long are expensive and hard to find. A standard window can fit an 84-inch curtain but if you want to hang your curtains higher than the window to give the room a larger feel, then it is a challenge. I want buffalo check or gingham curtains but all of the curtains that I found would take up a lot of my budget. I priced material and it was $7 a yard and that is more than I need to spend. I remembered this company that makes nice tablecloths and they are unbelievably inexpensive. If you order from them, go to retailmenot.com and get a coupon code for a discount. 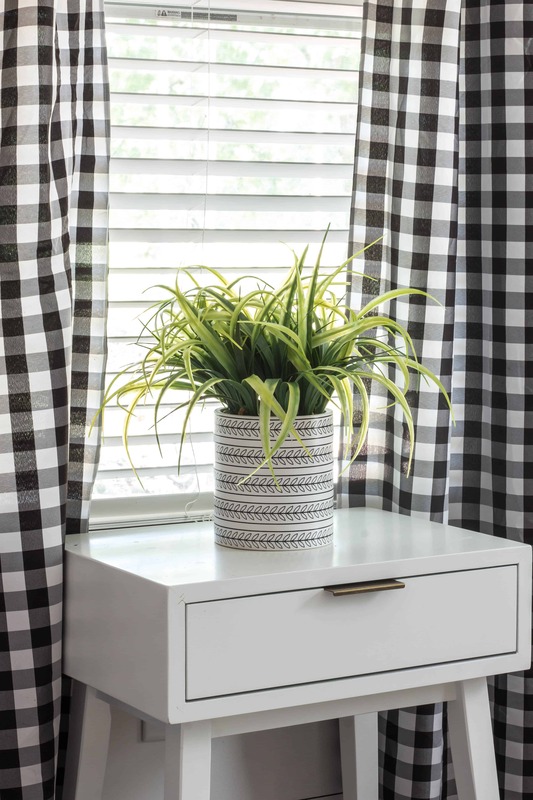 If you want the curtains already made, I found some black and white curtains on Amazon. I did the math and cut the tablecloth in order to make four curtain panels. The curtain behind the bed does not go all the way to the floor but that is okay because you can not see it and it gets so dusty under the bed plus it kept the price down for me. 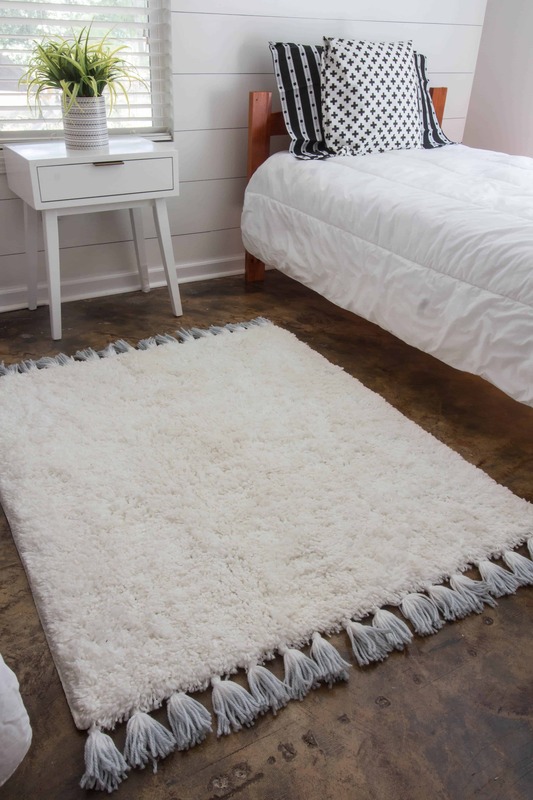 The DIY Dyed Tassel Rug cost $2.49 and was inspired by the Urban Outfitter Dyed Tassel rug that cost $369.00. Yes, under $3 for the Rit Dye and I used a rug remnant that I had and leftover yarn. I found these throws from Serena and Lily for $178.00 each and I really wanted them to throw across the beds. 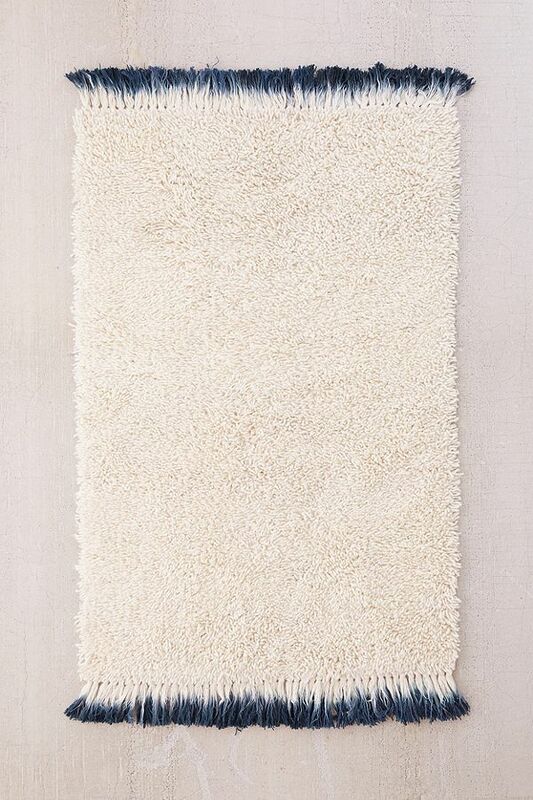 I was so excited to find these faux fur throws at Five Below for $5 each and that’s in the budget! The original plan was to build a side table for the room but when I ran in a store called Bargain Hunt, I saw this Project 62 table from Target and it was marked $10. I am thinking it must be a mistake but I love it and I love that I do not have to build a table for the room. Score! I found pillows that inspired me online and went to my local thrift stores to find something similar. 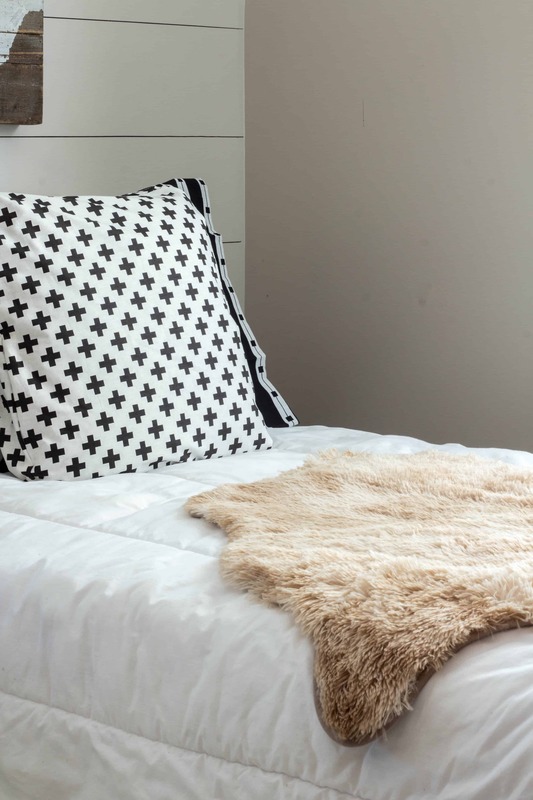 I purchased two new black and white shams from the thrift store for $1.59 each and then I purchased the plus sign material at Walmart for $4.97 and covered two pillows I already had. I found some on Amazon Plus Sign Pillow. Here is a money saving tip. 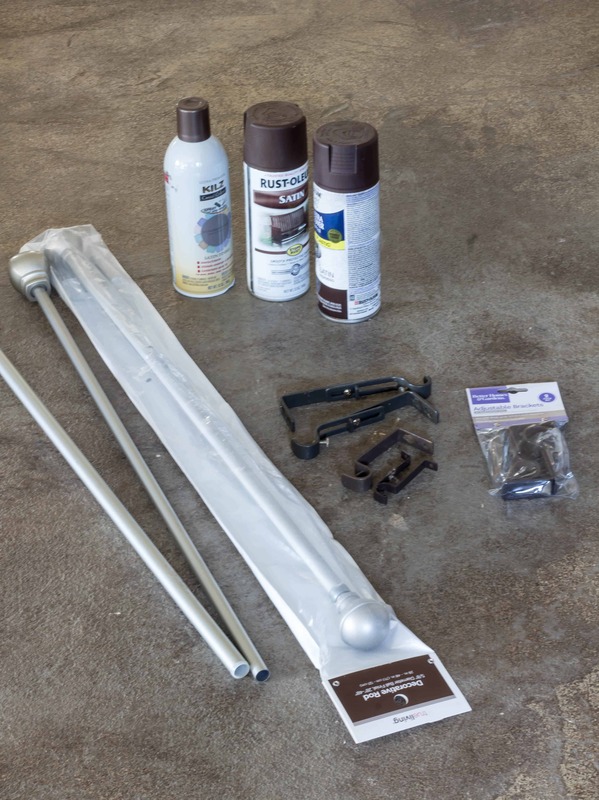 If you think that you are going to need curtain rods, spray paint what you already have. 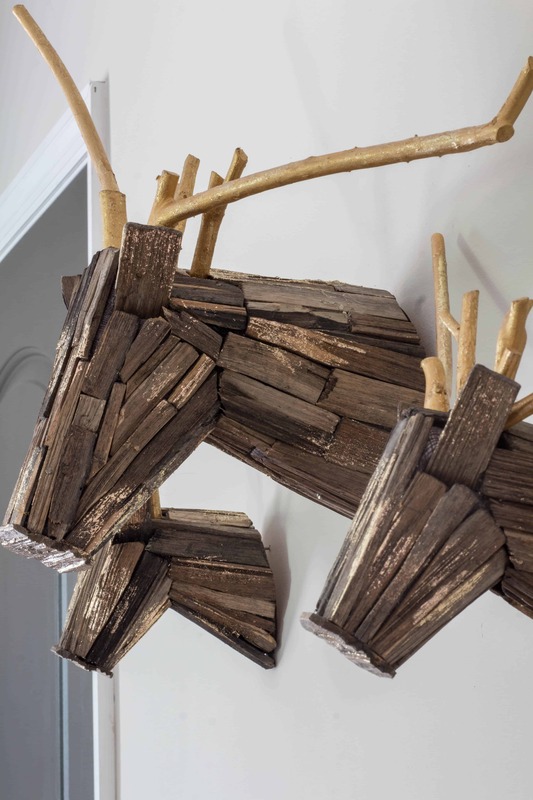 I have had these deer that I purchased at Target after Christmas 90% off clearance for several years and they look great in the new room. You can view the before and after pictures of the Lake House Remodel. You must visit all of the other $100 Room Challenge reveals for more inspiration and ideas. I have been asked for the art over the bed and I found something similar on Amazon. Wow! You would never guess this was a budget redo. Everything works together perfectly and looks like it was meant for this room. Great job! Great color scheme! I know there are interesting solutions for inexpensive fabric but I don’t think I would have ever considered using tableclothes for curtains – great idea! Thank you so much! I was determined to make the curtains affordable! Love this makeover. I used tablecloths for curtains in my family room once and it is a great money saver, plus they looked amazing. The black and white is so fresh and chic. Love it all. What a beautiful transformation Sherry. 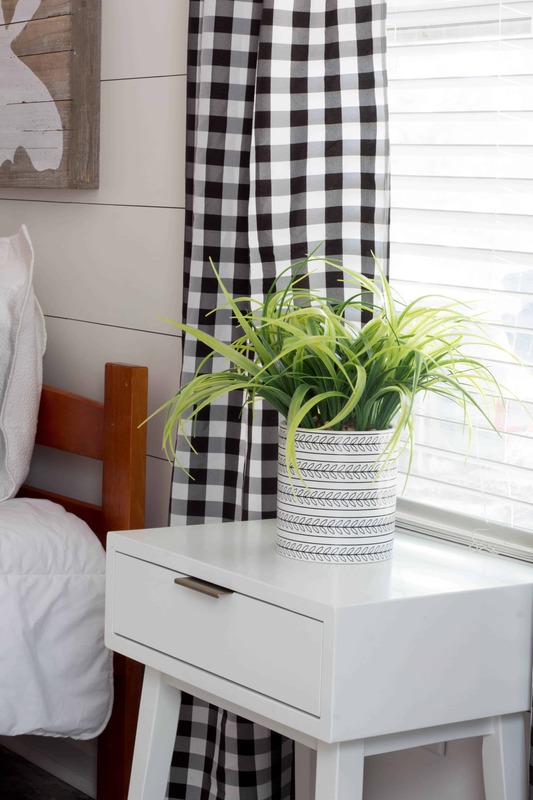 Those curtains add a pop of pattern to the simple room. And of course the art really helps to define it. Can you believe the prices at Urban Outfitters?? The room looks fantastic. I love how you were able to create a comfortable and stylish room and came under budget. Wow, amazing job for 76.98!! I cannot believe that you spent less than $80 on this project because it looks AMAZING!! Great job!!! I don’t even know where to start, I just love everything about this room! Those curtains and the little fur throws are perfect. And the moose and bear art! And I can’t believe you did all this for so far under budget. Awesome job! Thank you for the sweet words Meredith!! Wow! Every time I would scroll down to another picture I just kept saying “Wow!” This is such a fantastic transformation. I love all of your little touches- they really make the room. Great job! Thank you Beth! Your comment just made my day! This is ah-mazing!!! You are (for sure) a professional bargain shopper. I cannot believe the deals you found. And I’m definitely checking out your sharpie shiplap tutorial. I have heard mixed reviews on the technique, but yours looks awesome! Love this room SO much!!! Sherry, I need to go shopping with you because you, my dear, know how to score the big bargains! This room is fantastic and I especially love your faux shiplap walls! You found so many great deals and have so many awesome ideas! I can’t belief it’s the same room! Congratulations on your work! Love those checks! It turned out so great!! What an fabulous job you did! Your projects always amaze me!!! Paint pen shiplap wall!!! It all looks so good. Your rustic cabin feel is perfect for a lake house. And I’m so glad to hear that you encourage your husband’s input!!! Amazing! Hard to believe you did ALL that for less than $80! GREAT job! I love budget makeovers and this one is really beautiful!! This room! Perfect for a lake house! 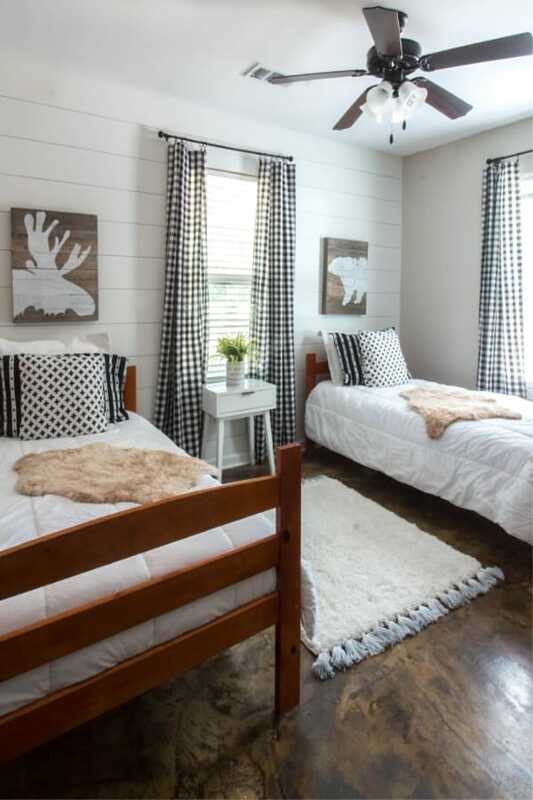 I love the moose and bear art above the beds! What great deals you found for this makeover. You really spent your money well! It turned out beautiful!